Water damage at this Phoenix home was the result of a water line feed top the hot water heater burst. A portion of the drywall would be removed to facilitate repairing the water source and drying the inside of the walls. 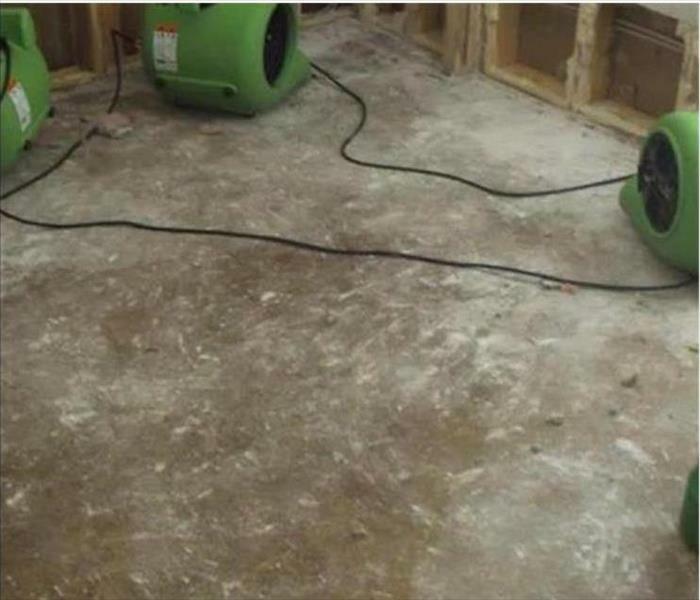 SERVPRO of Phoenix industry certified technicians would set up commercial air movers and dehumidifiers to help hurry along the drying process. The team at SERVPRO of Phoenix is your best option when your commercial property experiences a fire. We are available 24/7, locally owned and operated, and Faster to Any Size Disaster. Our fire damage specialists have the training, equipment, and experience to restore your commercial property to pre-damage condition. 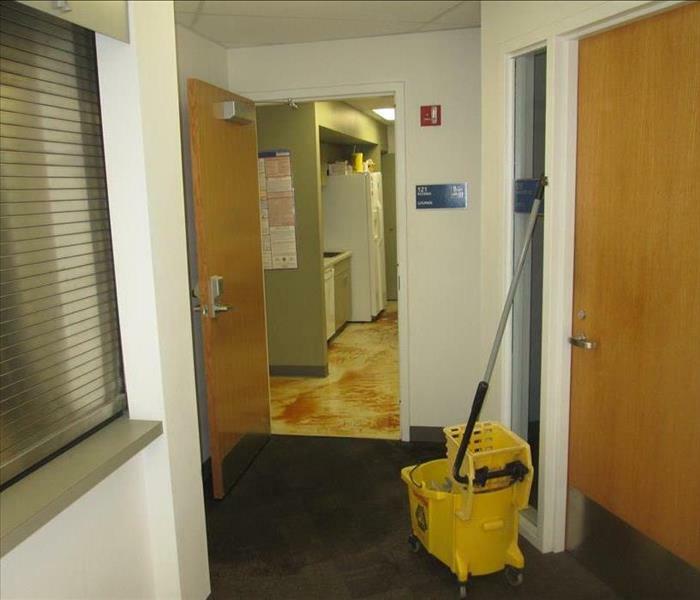 The ice maker in the snack room led to small flooding in this office in the South Mountain area of South Phoenix. SERVPRO arrived swiftly and removed the water with a wet-vac and the old, reliable, mob and bucket. 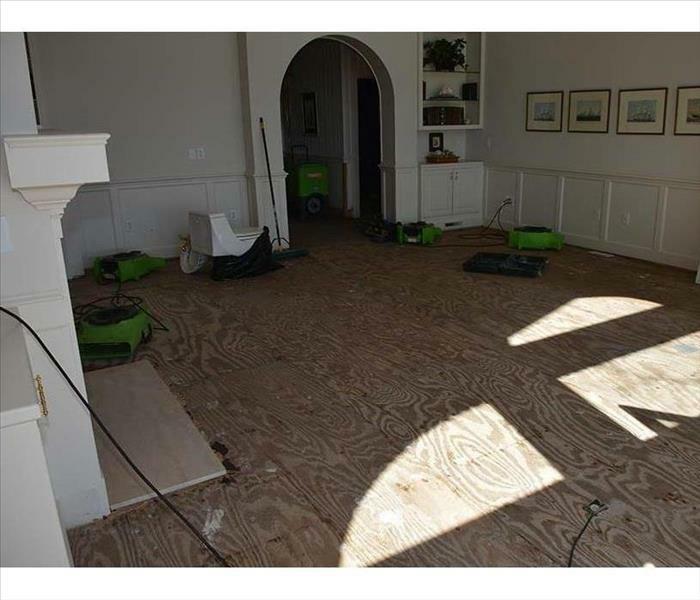 Our fast service prevented water damage to the walls and flooring. Mold damage in this Phoenix home developed under a cabinet in the bathroom. A small leak had developed in the water supply line to the sink. The moisture combined with the darkness proved to be a sufficient environment for a mold colony to develop. SERVPRO of Phoenix has the latest equipment and procedures to clean the mold damage from this bathroom safely. 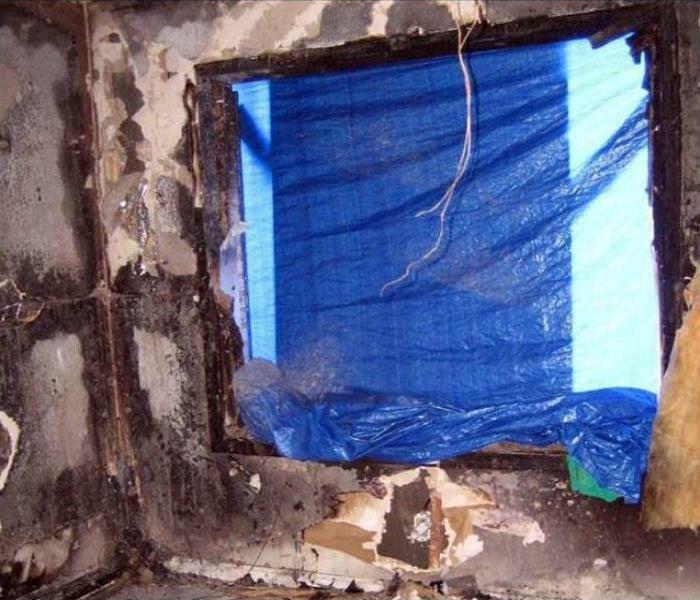 When soot from a fire covers ceilings and doors in the Phoenix area, professional cleanup can often salvage the building materials and prevent a demolition. The ceiling, when cleaned by a SERVPRO technician, can look like the white stripe on this ceiling. 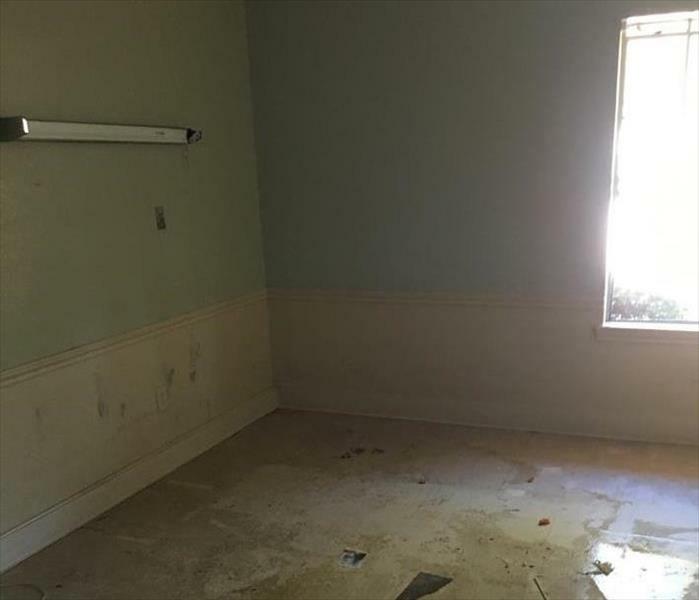 Water damage to this Lone Mountain office soaked the carpeting. The standing water can be seen in the photo. It is important to get the water suctioned up quickly in cases like this. If the water stands too long, the subflooring could absorb too much moisture requiring the carpeting to be torn out to dry the subflooring material properly. SERVPRO of Phoenix advertises that we are faster to any disaster. We make it a habit of delivering on that advertising slogan. Mold damage remediation in Phoenix requires trained personnel and the latest equipment available. SERVPRO of Phoenix employs industry certified technicians and has a large inventory of the latest high-tech equipment available. 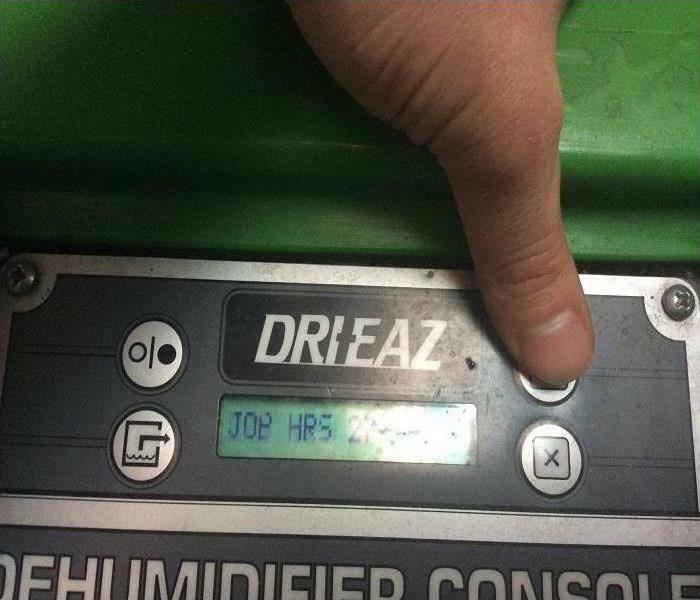 Pictured is an efficient, portable and reliable dehumidifier used to aid in drying on mold damage remediation projects. The Storm flooded this room in a Phoenix commercial building when the window glass shattered and allowed entry. SERVPRO team members can quickly and temporarily close the opening with a tarp or plywood sheet and then begin the water removal to mitigate damages. 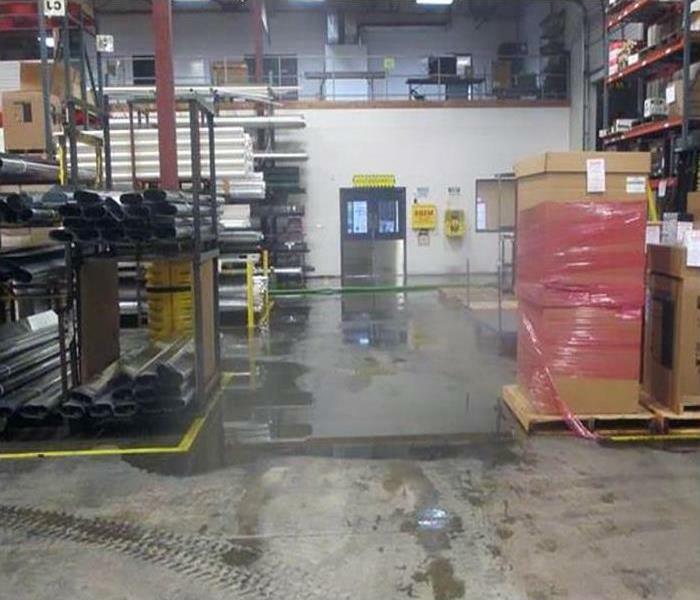 The worst thing that can happen in your warehouse is water damage. The fear of damaged inventory and losing revenue may seem too much but not when you hire the team at SERVPRO. Our team will arrive quickly at your property and begin the restoration process. SERVPRO of Phoenix has the personnel, equipment, training, and commercial water damage experience needed to restore your property to pre-damage. The smoke residue on this ceiling in a Lone Mountain home needs some special sponges to wipe away the stains without smearing the surface successfully. SERVPRO skilled techs can do this an reduce costs and disruptions to the homeowner by eliminating the need for a partial tear-out of the ceiling material. Storm damage in Phoenix can occur at several locations simultaneously with all suffering substantial losses requiring a large amount of water restoration equipment and staff to implement the procedures necessary. 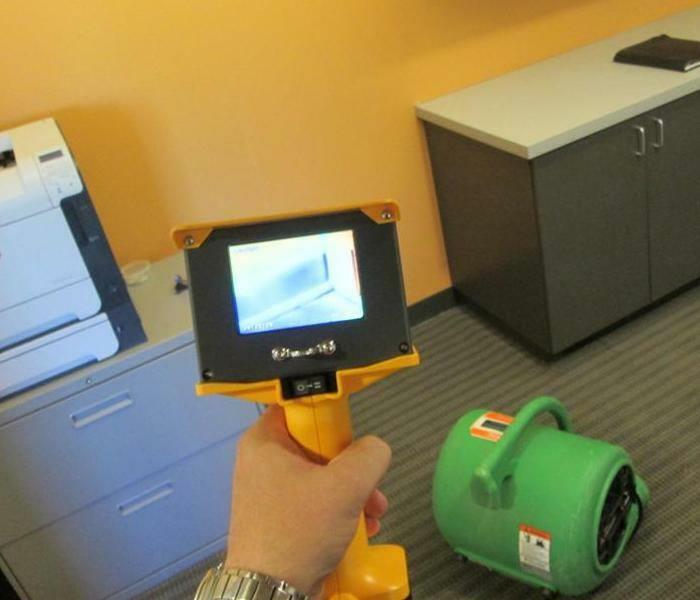 SERVPRO of Phoenix is well equipped with substantial inventories of water removal and restoration equipment and the trained staff to handle that equipment. 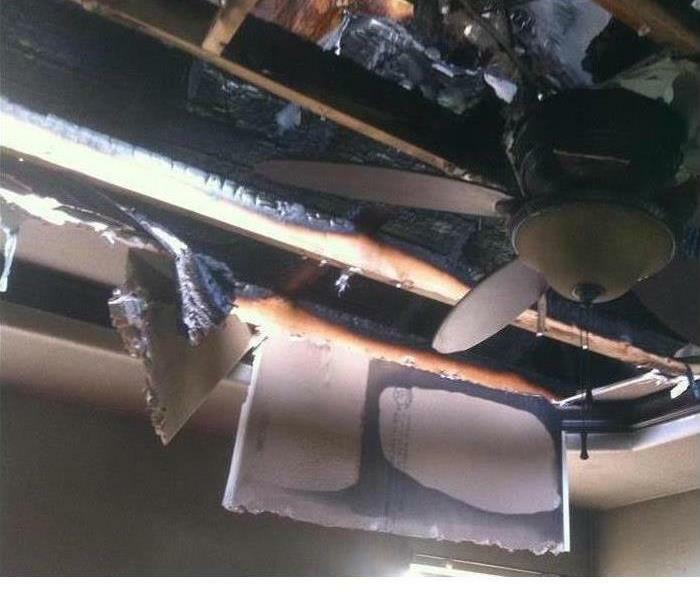 Water damage at this Phoenix home was severe. The water soaked into the subflooring beneath carpeting and pads. The carpet and pads would need to be removed to allow for proper drying of the subfloor. 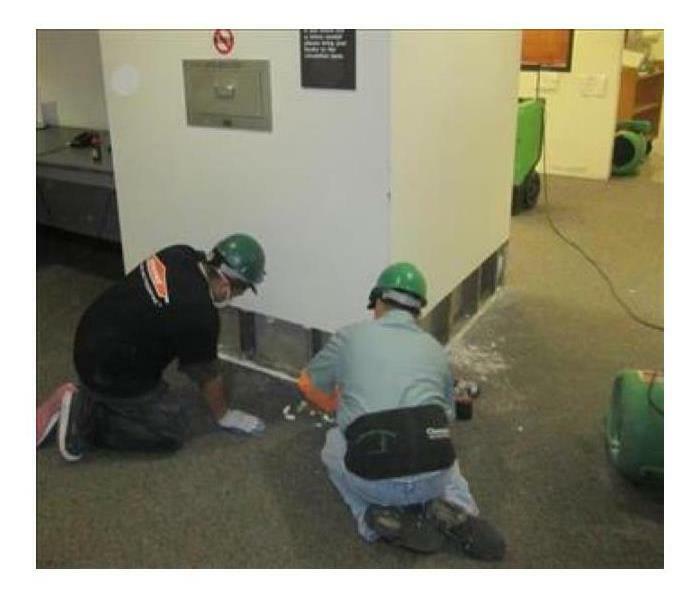 SERVPRO of Phoenix would use heated commercial air movers and dehumidifiers to dry the subflooring. The pooling water on this commercial grade carpet in this Phoenix hotel needed rapid removal to mitigate the damage. SERVPRO technicians can hop on Rovers, riding vacuums like lawn movers, to suction out the majority of the water and moisture. 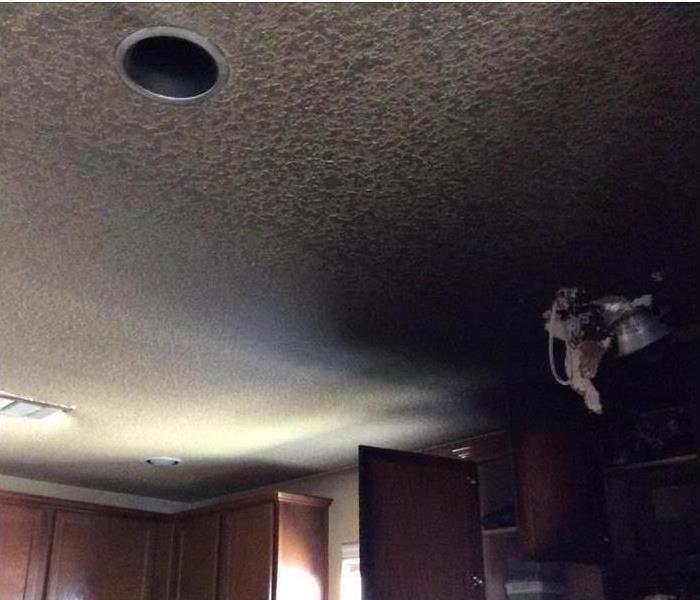 Fire damage struck this Phoenix house when the water heater caught fire in the HVAC closet. When the technicians of SERVPRO of Phoenix encounter damage such as this they would first assess the damage and then prepare a plan for restoration. The plan would be presented to the property owner and the insurance adjuster for approval. Upon approval, our trained technicians would carry out the restoration plan. While the Arizona summer monsoon season brings much-needed replenishment to our aquifers, it also brings flooding to Phoenix homes and businesses. This commercial facility had more than a foot of standing water. SERVPRO of Phoenix almost before the water receded to remove standing water, dry and sanitize this operation. They were back in business within hours! Removing the standing water is the first step in getting this commercial property dry after a dramatic fire sprinkler malfunction. Fire sprinkler systems dispense large quantities of water in a short time. The fire was extinguished quickly, wich saved lives and property, but the resulting water damage will take several days to dry out. Sometimes drying of the structural components of a building can require removal of finish materials so that dehumidified air can properly circulate to remove deeply bound moisture. Standing water in this Uptown Phoenix office building penetrated deeply into the materials, requiring removal of the drywall to access hidden, bound moisture. This flooded kitchen storm restoration in a Phoenix home illustrates the expertise of our SERVPRO applied structural drying technicians. The gutted drywall, not only limited the damage to the walls (why replace an entire 8-foot sheet) but aided in expediting the drying process. Rely on a professional, battle-tested team to help with your damaging water events. The infested walls and carpeting from mold growth in this Lone Mountain home needed a demolition. Our SERVPRO team carefully removed the contaminated building materials to prevent cross-contamination of fungi growth. Air movers were used to ridding the affected area of moisture, the initial cause of the mold infestation. This electrically induced fire severely damaged the ceiling of this room and also the crawl space in the attic. After the demo and clean up of the fire damaged material our SERVPRO techs set up several ozone machines to chemically clarify the indoor air and left along with the residents for the remainder of the first day of this service. The waters from the storm soaked the carpet and padding in this Phoenix home. The owner, not wanting to keep the water-logged fibrous flooring covering, as us to toss it and dry out his plywood based subfloor. 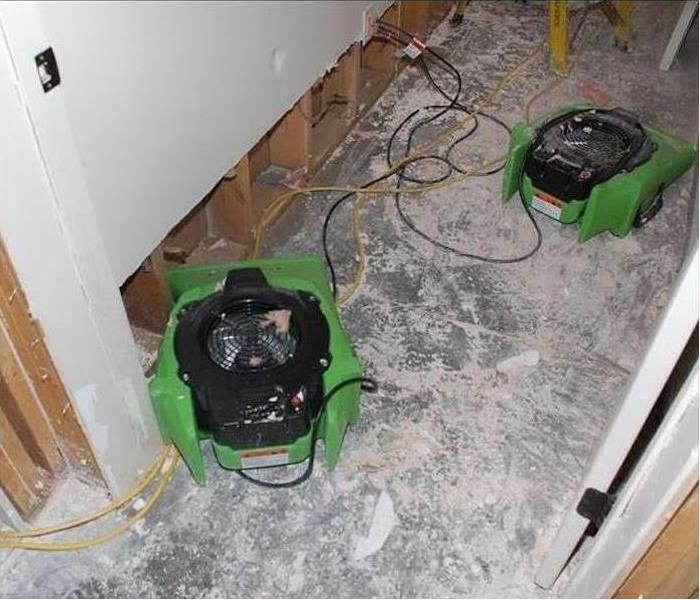 Our SERVPRO air movers and dehumidifiers are working to remove the excess water vapor. 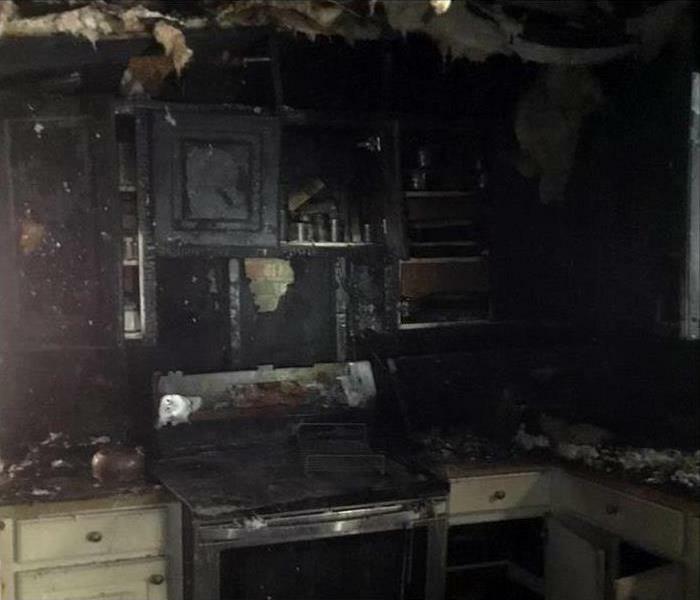 A Grease fire in this Phoenix kitchen damaged the range, back wall, wall cabinets, and the walls. The layer of soot was wipeable from the vinyl wallpaper and wood finished cabinets. The primary concern was removing the smoke odors from the house. An air scrubber, hydroxyl generator, and a final light fogging mitigated these smells and restored the home. Count on SERVPRO for a fast response with great results. SERVPRO of Phoenix found a rattlesnake just out side of a customers door. Wildlife in Arizona can be dangerous. 13 species of rattlesnakes are in the state of Arizona and can be seen as the temperature approaches 80 degrees. Wow, music room at a Tempe Arizona school is hit with monsoon flood waters. Pumps were installed and the basement was drained in a couple hours. Faster to any disaster! Some work days are just more fun than others! SERVPRO of Phoenix at the university football stadium. What a beautiful view from the top of the Arizona State University stadium. 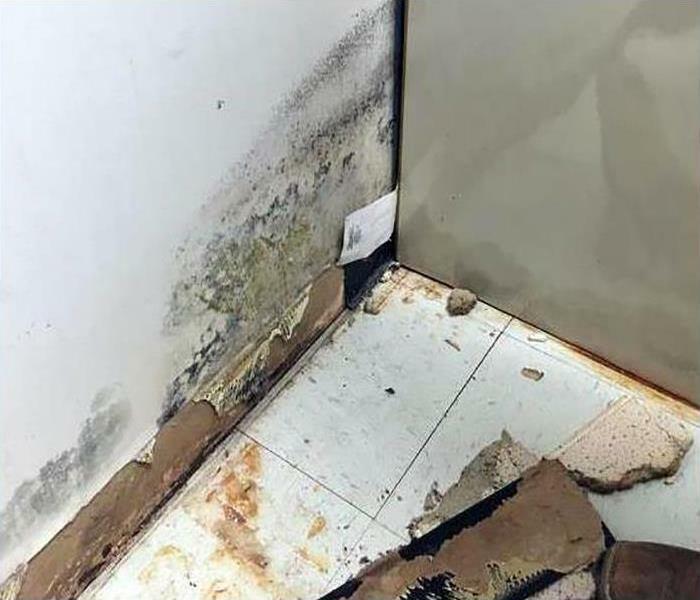 Wow, who knew a small leak could cause so much mold damage? This is mold growth from a long term slow water leak that went undiscovered by this homeowner in Phoenix. Doesn't take much to ruin an expensive floor! A small amount of water destroyed this gorgeous hardwood floor. Water damage to hardwood can cause warping and buckling. Call SERVPRO of Phoenix as soon as possible after water damage. It seems getting to the source of the leak would be a relief - and it was. Now the mold clean up and property restoration starts in ernest. This owner could not believe how the cleaning efforts made a big impact in two days. Sometimes water damage is not obvious with the naked eye. Here we use an infra-red camera to detect moisture behind the wall. Our advanced equipment and techniques allow for a complete inspection and assessment of a loss site. Call for a site inspection following a storm or internal water source break. Look what we found during demo. 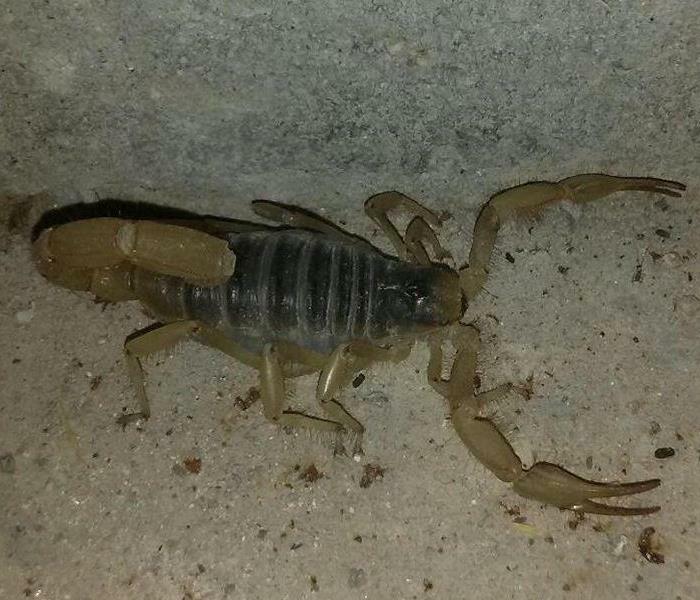 While demoing a home in Phoenix Arizona we discovered a scorpion behind kitchen cabinets. These animals only require a 1/16 of an inch of space to get into your home. Water entered this commercial office during the monsoons. Water damaged the flooring, walls, and cubical dividers. 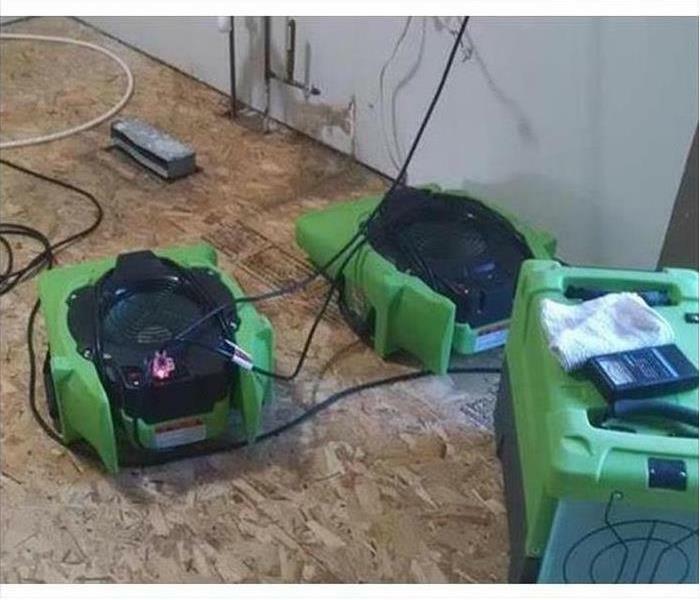 Extraction equipment was used to remove the standing water and fans and dehumidifiers were used to dry the office. A fire damaged the kitchen of this restaurant in Phoenix Arizona. 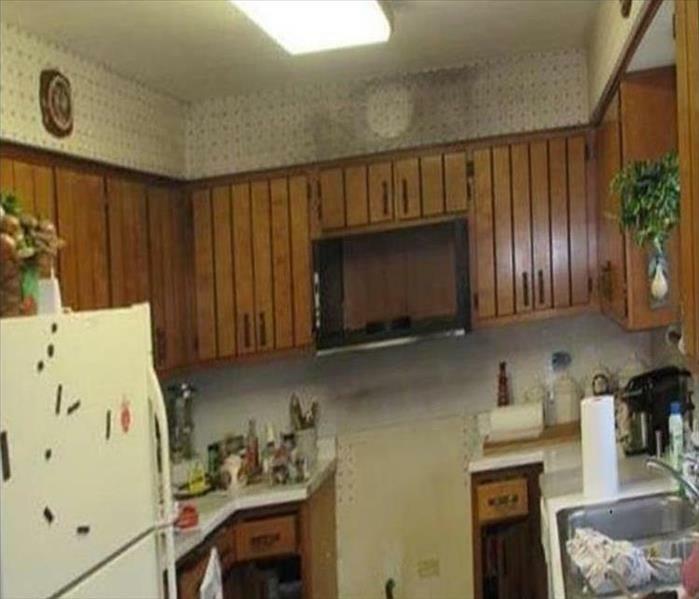 A layer of soot was left on all the appliances and counter tops. If your restoration company can't handle this, they aren't in the major league. Stocked and ready to roll when our clients need water dryouts. Faster to any disaster, fire or water in all central Phoenix locations, Arcadia, Moon Valley and across the Valley. SERVPRO of Phoenix is ready to take on the asbestos removal related to water loss or fire damage in Phoenix Arizona. Here to make it "Like it never even happened."